The 125th Regiment of the New York State Volunteer Infantry was organized at Troy, Rensselaer County, N. Y., to serve three years. 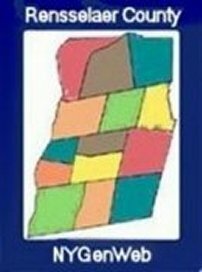 The companies of which it was composed were raised in the County of Rensselaer (Twelfth Senate District). The 125th Regiment was mustered into the service of the United States on August 29, 1862 and was mustered out of service on June 5, 1865, in accordance with orders from the War Department. [NOTE: A brevet rank was an honorary promotion given to an officer (or occasionally to an enlisted man) in recognition of gallant conduct or other meritorious service. A brevet rank served much the same purpose as medals play today; our modern system of medals did not exist at the time of the Civil War.] Main battles fought: Gettysburg; Mine Run; Po River; Wilderness; Bristow Station; North Anna; Spotsylvania; Totopotomoy; Cold Harbor; Deep River; Ream's Station; Strawberry Plains; Petersburg. Myer, Aaron B.              Lt. Colonel    Jul. 31, 1863       Jul. 3, 1862     Died May 8, 1863 of wounds rec'd in action at Wilderness, Va.